Our recent program to the stunning island of Bermuda left a very favorable impression on the members of two different companies who had recently become one. The cross functional group consisted of salespeople, engineering support personnel and management. This was one of the first opportunities for high performers from the individual companies to come together and meet each other. The goals of the program included recognizing high achievers from both companies, making new connections, building camaraderie and demonstrating a culture of high quality. The opening day did not disappoint. The company’s welcome gift upon arrival was a pair of Maui Jim sunglasses which became a fun event as each guest was encouraged to try on different styles in order to choose their perfect pair. That evening, the Fairmount Southampton outdid itself with an elaborate barbeque buffet on the beach. Picture the soft pink sand; bright , aqua-marine water; brightly decorated tables; exquisite, melt-in-your-mouth food; premium open bar and music that made you want to kick off your shoes and move. It was a surreal setting and the perfect kick-off for the 4-day get-a-way. The next morning the guests participated in a sailing regatta. 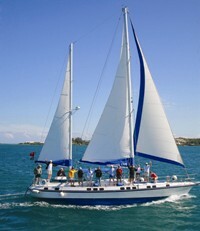 The 10-25 people in each boat could choose whether to take part in the work of sailing or relax onboard. The teams immediately got into competitive mode after receiving team hats and being instructed on the basics of sailing. They quickly learned the meaning of sailing lingo such as “come about” which basically means “duck!” This was an effective, experiential and fun team building exercise abetted by cool, refreshing beverages. While sailing through Hamilton Harbor, each team participated in a destination quiz based on what they heard during the briefing, terminology aboard the boat, some historical notes about Bermuda and what they saw along the way. Prizes were awarded to guests with the highest scores but everyone on board who enjoyed the beautiful day and the picture perfect scenery came away a winner. After a leisurely afternoon, the company hosted an awards dinner recognizing all the higher achievers. It was an opportunity for company executives to share their vision of the future and recognize excellence among their employees. The following day the guests chose their own company-sponsored event. Some played golf on the world-class Port Royal course, others took a “boat, bike and beach” tour around Hamilton Sound. Another group enjoyed a grilling/cooking lesson hosted by Goslings Rum. They tasted their way through a 3-course lunch sampling various rums and learning how to use the delicious liquid in marinades and sauces. 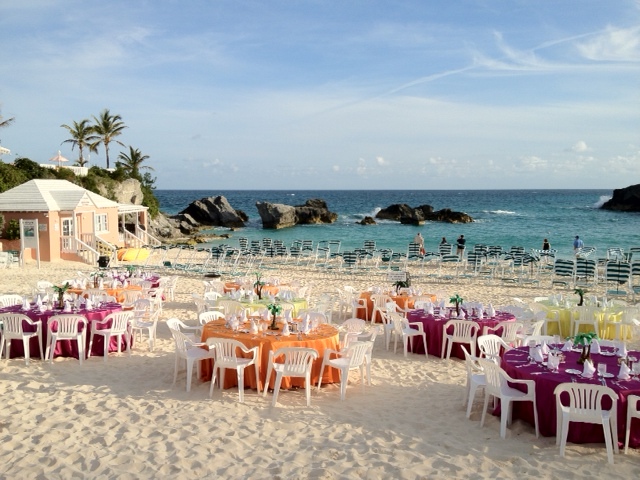 The final evening was free time for guests to sample the joys of Bermuda on their own. Our concierge service helped them select a restaurant and their evening entertainment. While the trip was short, the company achieved its goals of recognizing high achievers, bringing strangers together and using shared experiences to start new relationships.